Just yesterday, there was some concern that LTE-Advanced modems, while adding a whole lot of speed to your mobile device (assuming a capable network), would also be adding some bulk. This will surely happen, but luckily, technology always finds a way to get smaller and smaller, and today Broadcom proved that trend by showing off the world's smallest LTE-Advanced modem yet. The new modem is the Broadcom BCM21892, which is aiming to really put some pressure on the competition, especially Qualcomm. The BCM21892 is planned for use in top-of-the-line smartphones and tablets, combining a full cellular baseband with a world-band radio, and all at a size 35% smaller than the competition. In addition to the smaller size, the modem will offer LTE speeds up to 150Mbps (on networks that can handle it), as well as Voice over LTE (VoLTE). The big news there is that Broadcom claims the modem will be able to offer VoLTE services that use 40% less power than a WCDMA call. That's big news for those of us looking to ditch the old standard for voice calls and move to full VoIP networks (like the fabled Google Wireless carrier). The bad news is that we shouldn't expect to see this modem in devices until 2014, when it hits full production. So, Qualcomm and other mobile modem makers have some time to catch up. Broadcom Corporation (NASDAQ: BRCM), a global innovation leader in semiconductor solutions for wired and wireless communications, today introduced the industry's smallest 4G LTE-Advanced modem. Designed for the 4G LTE market, Broadcom's multi-mode, multi-band solution – the BCM21892 – delivers the features, power and performance capabilities for the development of next generation 4G LTE smartphones and tablets. 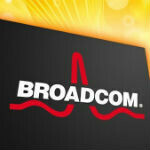 Broadcom will showcase its 4G LTE innovations at the upcoming Mobile World Congress show in Barcelona, February 25-28. For more news, visit Broadcom's Newsroom. Compliant with all 3GPP specifications, the BCM21892 combines a full-featured cellular baseband with a world-band radio in a footprint that is approximately 35 percent smaller than current industry solutions. Advanced power management techniques save up to 25 percent of the power typically consumed during data transmissions to the network. The new modem also supports LTE Category 4 speeds of 150Mbps1, operates in any 3GPP network and performs seamless hand-offs between the various 4G LTE, 3G and 2G interface technologies. 1 LTE Category 4 speeds of 150Mbps in 20MHz of spectrum or through carrier aggregation of multiple smaller spectrum bands Executive Vice President and General Manager, Mobile and Wireless Group. "Broadcom's 4G LTE modem will also help carriers drive new 4G LTE features, such as carrier aggregation, into commercial networks." -- A baseband with support for all current 3GPP standards technologies including LTE FDD and TDD, LTE-Advanced with carrier aggregation, HSPA+, TD-SCDMA and EDGE/GSM. -- An integrated world-band radio that can support virtually any designated 3GPP LTE frequency band and combination, a critical capability as operators prepare their networks for 4G LTE roaming. The radio also deploys advanced power management techniques that can save up to 25 percent of the power typically used when sending data to the network. -- A Voice over LTE (VoLTE) solution that enables high-definition voice calls over a mobile broadband connection – a key requirement of operators as they transition from legacy networks. Broadcom's VoLTE service consumes approximately 40 percent less power than a comparable WCDMA voice call. -- Enhanced interoperability with Broadcom's wireless coexistence technology, which minimizes the possibility of radio interference between Wi-Fi, Bluetooth and 4G LTE, and enables carriers to provide a richer Wi-Fi offload experience. -- Ability to interface with a broad range of stand-alone applications processors, allowing OEMs to design the 4G LTE solution into a wide variety of mobile devices. Ahh, there we go. I knew that Broadcom were going to bring some big guns. This is one hell of a shot across everyone's bow. Broadcom is looking to get in on the advanced market, which is great as they can build some great hardware for communication. Almost every router has a Broadcom chip in it so I'm expecting good/ great things from them on the mobile device front. Hopefully soon we'll have powerful phones that can last as long as an old flip phone. well there goes that 5GB limit in a nano second,, good bye verzion, good by ATT, you wana bet these greedy carries wont enlarge that 5gb to maybe 10gb w/out a price increase!